A 2,000bhp Toyota Land Cruiser recently made it in the Guinness World Record by doing 370km/h. A Nissan Qashqai in U.K just went faster. 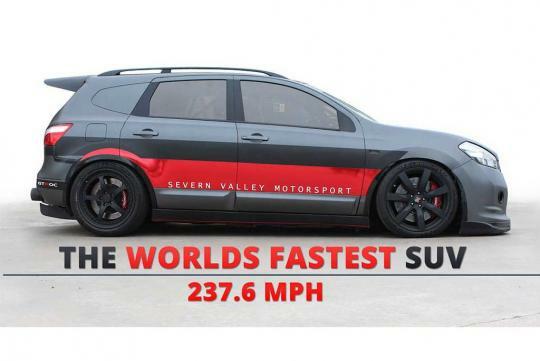 Built by a well-known tuning company in Britain that is known as Severn Valley Motorsport (SVM), this Nissan Qashqai has 2,000bhp too and it has been filmed doing 382km/h. To allow a SUV to get that kind of speed, SVM naturally went with a highly modified 3.8-litre twin-turbo V6 from a 2012 R35 GT-R. Despite clocking more speed than the Toyota, the Qashqai-R is not the fastest SUV in the world as it is not recognised by the officials from Guinness World Record. To get into the official book, a minimum of two runs are needed and the average taken from those passes.